Former vice president, Atiku Abubakar, has selected ex-Governor of Anambra State, Peter Obi as his running mate. This was the outcome of a meeting held in Abuja on Friday. Atiku polled 1,532 votes in the Peoples Democratic Party [PDP] presidential primaries in Port-Harcourt, Rivers State, ahead of Sokoto State governor, Aminu Waziri Tambuwwal who polled 693 votes. Insiders say Atiku made wide consultations before the decision. An official announcement is being prepared by the Atiku campaign. 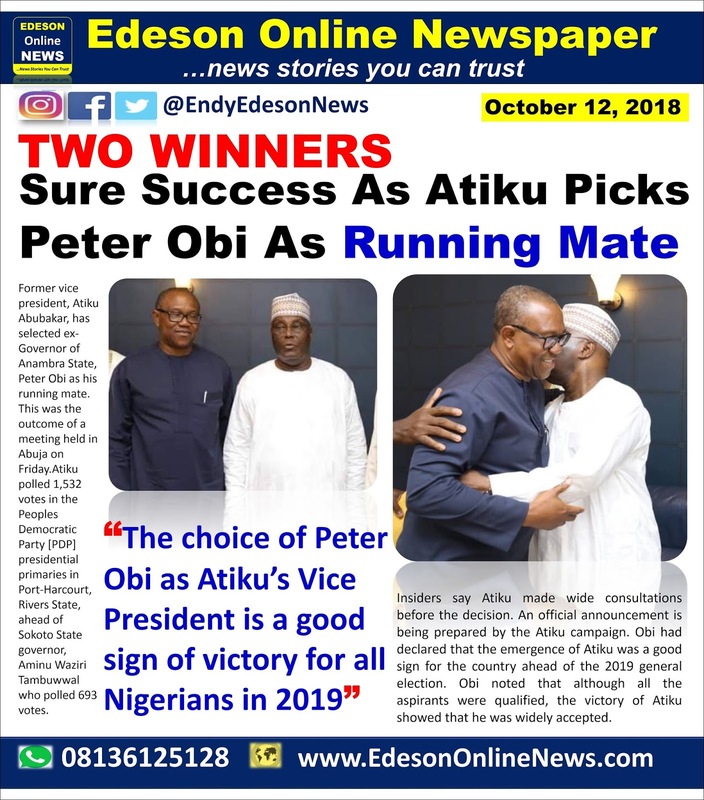 Obi had declared that the emergence of Atiku was a good sign for the country ahead of the 2019 general election.Obi noted that although all the aspirants were qualified, the victory of Atiku showed that he was widely accepted. derailed off the paths of development, Obi said that going by “Atiku’s wealth of experience, track record of wealth-creation, knack for identifying excellence among excellent people, detribalised nature and perfect understanding of the ills of the country”, the former VP had all it takes to restore the nation’s glory. Endy Edeson.. Kai.. You aren't the blogger I thought you were..